Thousands of people take part in protest marches across Bolivia amid a general strike called by opponents of President Evo Morales’ bid for a fourth term. Despite all the violence, it is refreshing to see the youngsters, our Millennials that fight for their future, that want to protect our vote, our democracy, our lives! He wants to remain in power at ALL costs, and all violence and deaths are the sole responsibility of this delusional autocrat! 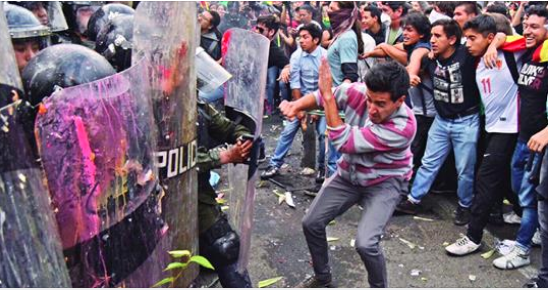 This entry was posted in Bolivia, Politics, Social Unrest and tagged bad politics, corruption in public office, democracy in peril, government failures, human rights, police brutality, tyranny. Bookmark the permalink.